We have sent our passports and visa applications to the High Commission of Cameroon in Pretoria, and we are hoping and praying for favor, that we will indeed receive the 6 month multiple entry visas that we’re applying for. 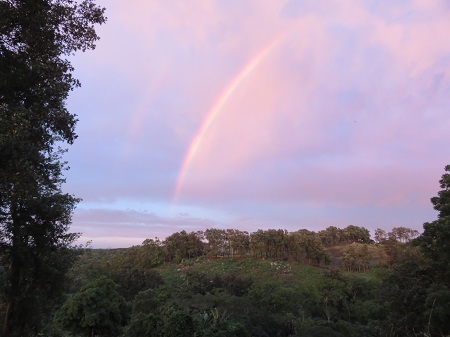 We woke up this morning to an amazing rainbow in the west with sunrise colors in the clouds, and we were reminded of God’s promises and his faithfulness in all things. We’re trusting that all will go well because we look forward to returning to CAR (a country for which we do not need visas) via Cameroon (the closest and safest big airport) on April 6th, after our Covenant Africa missionary conference in Kenya. Please pray for that conference, that all journeys to and from will be safe and that we will have a refreshing and renewing time together. When we leave Kenya, we will be in CAR for 5 months, and at the end of August, will say goodbye to our friends there, and then head to South Africa again to finish up our career in June as Covenant missionaries to Africa.